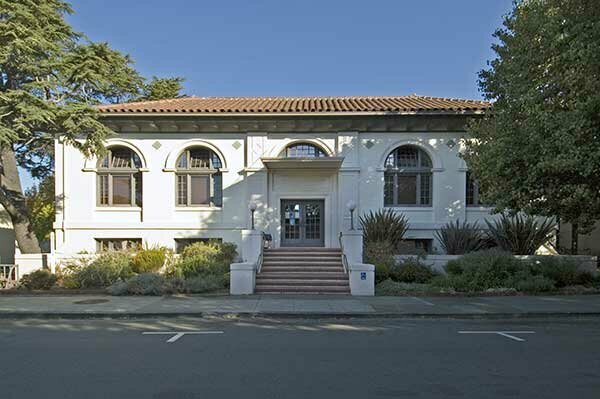 San Anselmo's Carnegie library, at the corner of San Anselmo Avenue and Tunstead Avenue in the town center, is adjacent to the Town Hall to which it is connected by a wisteria-covered arbor replicating the library's carved rafters and contributing to an Old California aspect. 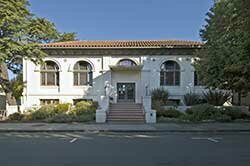 The Spanish Revival style is also carried out in the red tile roof and use of decorative tile and arched windows. 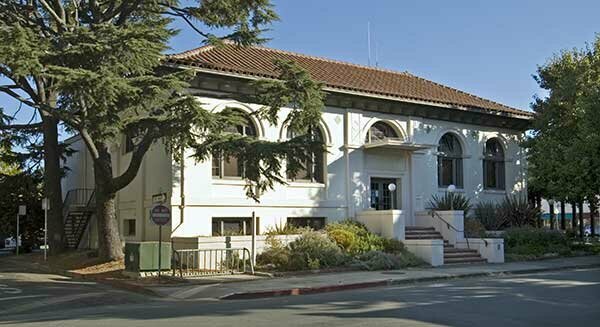 The Women's Improvement Club of San Anselmo believed that the 1910 population of just 1,531 would not qualify for a Carnegie grant. They embarked on a fund raising effort themselves but were rescued by Judge Morrow, a local federal judge and Carnegie trustee. A grant of $10,000 was offered in 1914. Town Hall architects Mitchell and Hodges designed the building; Fred F. Fields was the builder. James Bertram found fault with the site as being too narrow a rectangle. The plan was also lacking a basement, and Hodges eventually raised the site four feet. In 1960 the original rectangle was squared with an addition to the rear. Inside, Craftsman detailing has been maintained and interior arches connect the new with the old.